Deatschwerks 340lph "DW300C" Compact High Flow Fuel Pump Kit. The Deatschwerks DW300C fuel pump flows 340 LPH and will allow your Civic / RSX to inject more fuel, run higher boost and make more power. Model: ACURA RSX. ACURA RSX 05-06 Pump Assembly, Base. ACURA RSX 05-06 Pump Assembly, Premium (Canada market). Part Grade Abbreviations. cc = Credit Card size units. C = Greater than 200k miles. B = Greater than 60k miles and less than or equal to 200k miles but greater than 15k miles per year. 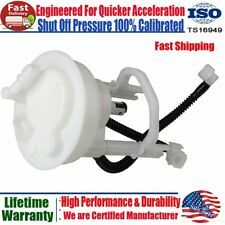 Parts Geek - For 2002-2004 Acura RSX Fuel Pump 28186HC 2003 2.0L 4 Cyl. 2002 Acura RSX 2.0L 4 Cyl. 2003 Acura RSX 2.0L 4 Cyl. 2004 Acura RSX 2.0L 4 Cyl. 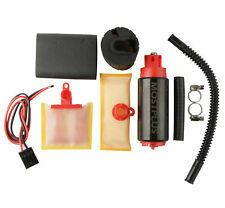 Notes: Fuel Pump Module Assembly -- Includes Fuel Pump, Sending Unit, Float, Fuel Reservoir, Fuel Strainer and Tank Seal. EBC 01-07 Acura RSX 2.0 USR Slotted Front Rotors Choose from EBC plain non drilled rotors or sport rotors in two choices - wide aperture 3GD series for cooler running or new SUPER SILENT Ultimax USR slotted series. All EBC rotors are British made and are precision machined in the UK. Rotors are made from high quality grey iron to exacting standards and undergo extensive testing and rigorous quality control.Slotted rotors can significantly improve brake performance and longevity when used with a matching high friction pad set. Having sold hundreds of thousands of brake kits EBC Brakes feel confident their approach is as perfect as it gets. ACURA RSX (2002 - 2006). ACURA RSX S (2002 - 2005). ACURA RSX TYPE-S 2006. NEW BOSCH FUEL PUMP KIT. 1 FUEL PUMP STRAINER. 1 FUEL PUMP WIRE HARNESS. Note: Color of the pump and box may differ from the picture. Operation : Electric. Fuel sending unit included : With Fuel Sending Unit. Therefore all implied warranties that may apply to your part are limited to the duration of this written warranty. Each warranty gives you specific rights, and you may have other rights which vary from state to state. Weapon R 02-04 Acura RSX / 03-05 Honda Civic Si NEO TI Torque Damper Kit Neo-Ti Engine Torque Damper Kit by Weapon-R. Eliminate flex in the drivetrain, get more power to the ground and improve shift quality with this Neo-Titanium Finish Torque Damper Kit. The Engine Torque Damper Kit will also enhance the appearance of your engine bay. The damper’s anodized finish, Heim joints and black mounting brackets will add a “trick” look to your car. The Engine Torque Damper Kit comes with all mounting hardware and complete installation instructions. Manufacturer: DeatschWerks. DeatschWerks Fuel Pump - DW300: Introducing the highest flowing in-tank pump yet. 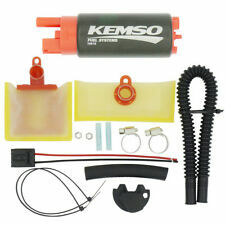 Universal pump kit includes: . 4" of fuel line. Electrical connector. 2"x2" sock. 3-year no-fault warranty. 100% Genuine Walbro Made in USA, 10 Year Walbro Dealer! Fuel Pump Part # GSS342. All fuel first passes through fuel injectors and a fuel pressure regulator which only send the required amount of fuel into the intake manifold, sending the unused fuel back to the fuel tank. Sparco Base Acura Rsx 02-06 Lft 600 Series Driver Side Flat Seat Base (600SB032L) by Sparco. Designed to be vehicle specific, this product ensures a 100% bolt-in installation. It utilizes the factory seat mounts in your vehicle's floor and provides a flat surface for mounting your Sparco seat. In addition to the mounting holes provided for standard bolt-on installation, this base has a wide metal platform that allows for custom mounting of side mounts directly to the base (drilling required). 3/16 steel construction for extra durability. ACURA RSX FULL BLOWN DUAL PUMP HANGER. No more sumping the tanks on your HIGH HP cars! Our Dual Pump Hanger is CNC machined from top notch billet aluminum then anodized for a long lasting protective finish. Mishimoto 02-04 Acura RSX Black Silicone Hose Kit Mishimoto Acura RSX radiator hose kits are made with a dual layer combining high grade silicone and heat-resistant embedded fibers to provide efficient heat reduction and increased pressure tolerance, all with designed and engineered for a direct OEM fit. The perfect replacement for stock Acura RSX hoses. "Assembly" or "Assm" will include the sending unit and "pump only" is only for the pump itself. Our goal is to eliminate any surprises upon arrival. The warranty period starts when you take possession of the part. Weapon R 02-04 Acura RSX Engine Damper Aluminium Engine Torque Damper Kit by Weapon-R. Eliminate flex in the drivetrain, get more power to the ground and improve shift quality with this Torque Damper Kit. Exedy OE 2002-2006 Acura RSX L4 Clutch Kit OEM Clutch Kit (KHC10) by EXEDY. Does not Include: Flywheel. Disc Outer Diameter: 8 1/2" (215mm). Input Shaft Spline: 1 1/32" x 24 Teeth. Clamp Load: 1596 lbs. Replace your failing OEM clutch with a new, OEM-quality EXEDY clutch assembly. EXEDY is a Tier 1 Supplier to Ford and GM, as well as 11 Japanese car manufacturers. Notes: Fuel pump module assembly. Fuel Sending Unit Included: Yes. FIND THE RIGHT PART FOR YOUR CAR. Overdrive has been in the automotive parts industry for over 15 years. QUICK LINKS. MIRROR ASSEMBLIES. Parts Geek - Fits 2005-2006 Acura RSX Fuel Pump Airtex 23583RW 2.0L 4 Cyl. 2005 Acura RSX 2.0L 4 Cyl. 2006 Acura RSX 2.0L 4 Cyl. Notes: Fuel Pump Module Assembly -- Includes Fuel Pump, Sending Unit, Float, Fuel Reservoir, Fuel Strainer and Tank Seal. Exedy 2002-2006 Acura RSX Type-S L4 Stage 1 Organic Clutch Exedy Corporation of Japan is one of the largest independent OEM suppliers.We supply all of the major Japanese vehicle makers as well as Ford and GM in the US.We are also the leading manufacturer of racing clutches in Japan and supply all six factory vehicle manufacturer's race teams. FEATURES: * Ultra Fiber Discs provides high heat resistance essential for street performance and mild racing applications. 02 03 04 ACURA RSX BASE FUEL PUMP ASSEMBLY OEM K20 Sending Unit. Condition is Used. HERE IS A FUEL PUMP ASSEMBLY AS SHOWN REMOVED FROM A 2003 RSX TYPE S. GOOD WORKING CONDITION. WILL FIT ONLY 2002-2004 RSX TYPE S.
_gsrx_vers_837 (GS 7.0.15 (837)). -IF A ITEM HAS BEEN ALTERED OF ITS PHYSICAL AND FUNCTIONAL FORM IN ANY WAY, IT VOIDS TAE AUTHENTICITY. ACT 2002 Acura RSX HD/Perf Street Sprung Clutch Kit Heavy Duty Street Single Disc Clutch Kit (AR1-HDSS) by ACT. Includes: Perf Street Sprung Disc P/N 3000108, Alignment Tool P/N AT78, P/PL Heavy Duty P/N H024, Pilot Bushing P/N PBNA004, Release Bearing P/N RB313. Does not Include: Flywheel. Disc Outer Diameter: 8.4". Input Shaft Spline: 1 1/32" x 24 Teeth. Disc Center Style: Sprung. Pressure Plate Style: Heavy Duty. This kit features ACT's most popular Heavy Duty pressure plate and most popular street disc. ACT Heavy Duty pressure plates use exclusive diaphragm design to increase clamp load, reduce deflection and maximize clutch life. All diaphragms endure a four-stage, heat-treating process for unparalleled performance. 2002 Acura RSX 2.0L 4 Cyl K20A2. 2002 Acura RSX 2.0L 4 Cyl K20A3. 2003 Acura RSX 2.0L 4 Cyl K20A2. 2003 Acura RSX 2.0L 4 Cyl K20A3. 2004 Acura RSX 2.0L 4 Cyl K20A2. 2004 Acura RSX 2.0L 4 Cyl K20A3. 2005 Acura RSX 2.0L 4 Cyl K20A3. 2002 Acura RSX. 2003 Acura RSX. 2004 Acura RSX. Ensure Proper FitTo confirm that this part fits your vehicle, enter your vehicle's Year, Make, Model, Trim and Engine in the Compatibility Table. Koni Sport (Yellow) Shock 02-06 Acura RSX - Front The Koni Sport product line is one of our specialities. Koni serves Sporting Drivers with a carefully designed range of sport shock absorbers. This product focuses on exceptional road holding and handling, combined with a reasonable level of driving comfort. They can also be used with spring kits to lower a vehicle up to 35mm. Many of the Koni Sport dampers are externally adjustable by means of an adjustment knob at the top of the damper. This means you do not have to remove the damper from the vehicle to adjust the rebound forces. All Deatschwerks high flow fuel injectors are built using only quality OEM cores. In addition, each set is balanced to within a 2% flow variation. All injectors are backed with a comprehensive 12-month warranty. Exedy 2002-2006 Acura RSX Type-S L4 Lightweight Flywheel EXEDY Lightweight Flywheels combine low weight, low inertia and high thermal capacity. They are designed for light to moderately tuned racing cars for drag racing, autocross and rally events, as well as street usage. They are made from solid one-piece billet chromoly steel or chromoly steel forgings. They are specifically designed to reduce weight and inertia for better engine response. Most incorporate special design features to enhance the airflow which improves the cooling of the clutch. Mishimoto 02-06 Acura RSX 60 Degree Racing Thermostat The Mishimoto racing thermostat for the 2002-2006 Acura RSX will promote greater cooling efficiency throughout your engine. The Mishimoto racing thermostat will significantly decrease high engine temperature resulting from modified and upgraded turbo applications. Once the engine is fully warmed up, the Mishimoto racing thermostat will open up at a lower temperature (68° C) than standard RSX thermostats (78° C). This allows the coolant to flow through the engine sooner, thus reducing and maintaining cooler engine temperatures. REFERENCE PICS! HERE IS A FUEL PUMP ASSEMBLY AS SHOWN REMOVED FROM A 2005 RSX TYPE S. GOOD WORKING CONDITION. WILL FIT ONLY 2005-2006 RSX TYPE S. WE HAVE SEVERAL OF THESE. YOU MAY NOT RECEIVE EXACT ONE PICTURED, BUT AN IDENTICAL ITEM IN SIMILAR CONDITION. Borla Acura RSX 02-06 TYPE S Catback Exhaust Touring Stainless Steel Cat-Back Exhaust System with Single Rear Exit (140002) by Borla. Exhaust Type: Cat-Back. Exhaust Tubing Material: Stainless Steel. Main Tubing Diameter: 2.25". Exhaust System Sound: Mild / Stock. When you want the best performing, best sounding, and highest quality exhaust system, you want Borla. Borla straight-through mufflers and mandrel-bent exhaust tubes are custom tuned to deliver the most horsepower possible, with a subtle, slightly louder than stock sound at cruise. And the quality, aircraft-grade, austenitic stainless steel construction allows Borla to back every Cat-Back system with an unequaled million-mile warranty. Parts Geek - For 2005-2006 Acura RSX Fuel Pump Delphi 18263TH 2.0L 4 Cyl. Notes: Fuel Pump Module Assembly -- Strainer is inside the module assembly; Delphi is an OEM supplier; Fuel tank contamination is the leading cause of premature fuel pump failure. Exedy OE 2002-2005 Acura RSX L4 Clutch Kit OEM Clutch Kit (KHC09) by EXEDY. Does not Include: Flywheel. Disc Outer Diameter: 8 1/2" (215mm). Input Shaft Spline: 1 1/6" x 24 Teeth. Clamp Load: 2023 lbs. Replace your failing OEM clutch with a new, OEM-quality EXEDY clutch assembly. EXEDY is a Tier 1 Supplier to Ford and GM, as well as 11 Japanese car manufacturers.